"Lovely Rita" is a McCartney song from Sgt. Pepper's Lonely Hearts Club Band. The Beatles facts here is that McCartney got the idea to write the song after learning that city emploees in America who check parking meters were called "meter maids." He liked the expression enough to build a song around it. Instead of having the song's narrator dislike the meter maid, McCartney gave the song a twist by having him fall for the rather stern, military-looking meter maid. The song was recorded February 27, 1967 at Abbey Road, with overdubs on February 24 and March 7 and 21, 1967, reflecting how much time the band spent on the album. McCartney does lead vocal and joins Lennon and Harrison for backing vocals. 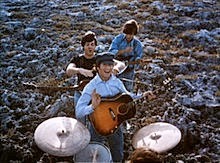 McCartney plays bass, piano, and kazoo (some say a comb-and-paper type), Lennon acoustic guitar and kazoo, Harrison acoustic guitar and kazoo, Star drums, and George Martin honky tonk piano.